If you haven’t realized yet, I have an insane sweet tooth. 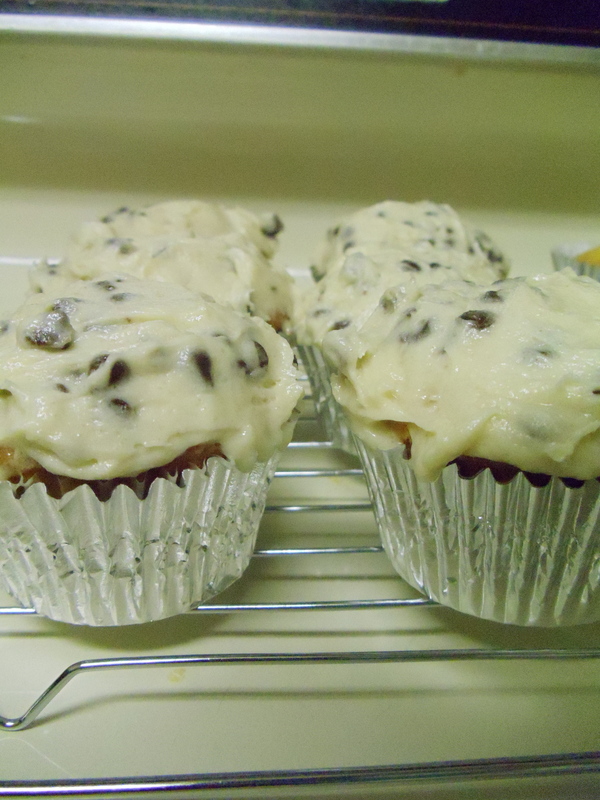 So, when I first started looking around for recipe inspirations everyone was chatting about how delicious cookie dough cupcakes typically are. Well, I was sold on this idea immediately. I’ve mixed together a couple of foodie recipes for these little delectable desserts, and oh my were they good! 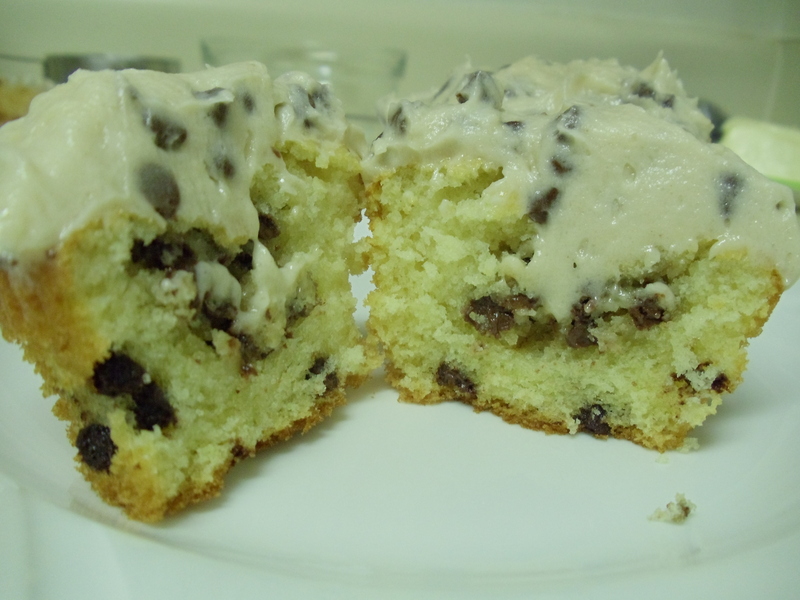 From the cookie dough center to the icing with cookie dough in it, it’s almost too much. But for a sweets lover it’s just right. The cookie batter recipe came courtesy of Love and Olive Oil and I will be thankful for years to come. You’ve got to freeze the cookie dough before you can bake it, so I went ahead and did this step the night before. But they should be frozen after a couple of hours. 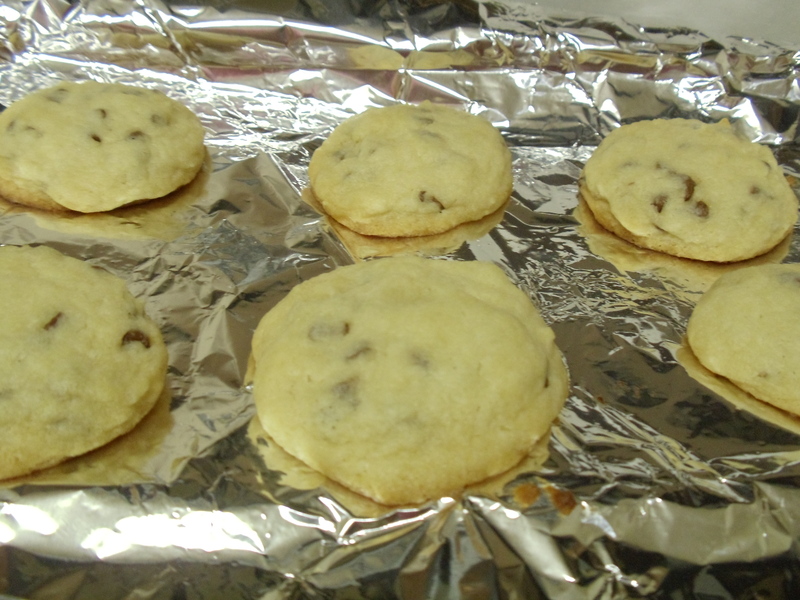 I made cookies out of the extra dough for a little taste…I’d never had eggless cookies before. Honestly, I couldn’t tell a difference. All I know is that they were fabulous. Next up, the cupcake batter. For my husband’s sake I went with a vanilla cupcake as to not overload him with chocolate this week. Beat butter on high until soft (about 30 seconds). Add sugar and continue beating on medium-high until light and fluffy (3 minutes). Then add eggs one at a time as usual, beating slightly in between. Sift flour, baking powder, and baking soda in a bowl. Measure milk and vanilla. Add 1/3 of the dry ingredients followed by 1/2 of the milk and so on and so on ending with flour. I added 1/2 a cup of mini semi-sweet chocolate chips to the batter on a whim. A good decision. Be sure you scrape the sides and bottom of your bowl. Pour batter into cupcake paper-lined muffin tins filling them 3/4 full. Bake for 20-22 minutes or until a cake tester comes out clean. So, for the frosting I stuck with Love and Olive Oil‘s recipe since the cookie dough itself was so good. And this decision certainly paid off. 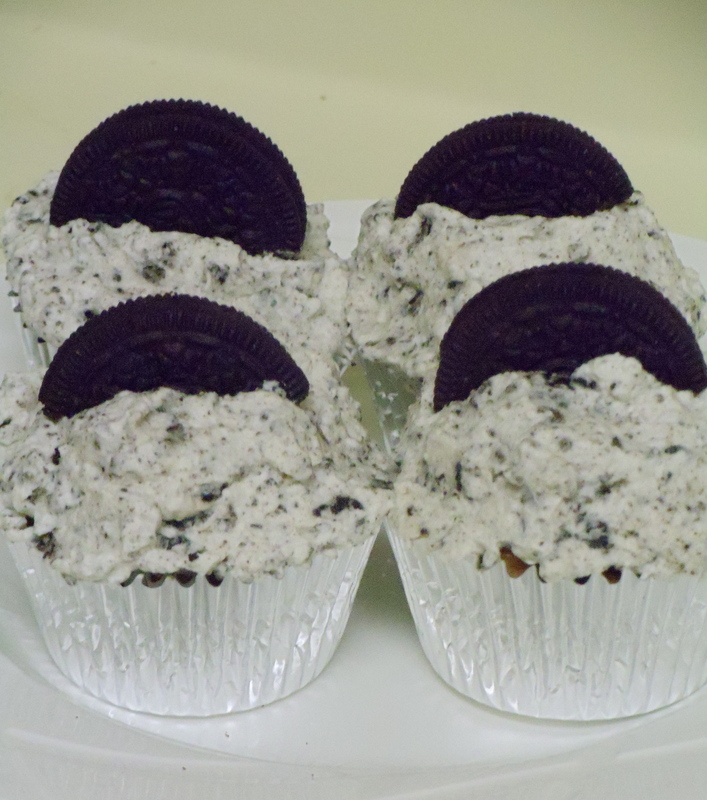 I was inspired by the cookie dough cupcakes and decided to pick up some Oreos to use in a cupcake. I used the same cupcake recipe as above for these cakes with a few moderations to make them their own special cookie creation. 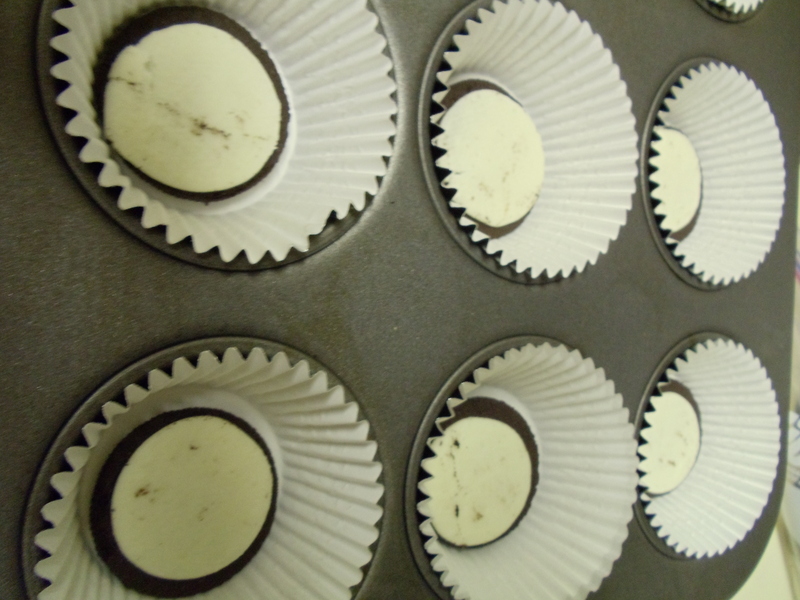 Before baking these cupcakes, place half of an Oreo at the bottom of each cupcake tin. Make sure that there is cream on the cookie. Beat the whipping cream adding sugar and vanilla extract. Once you’ve got a fluffy consistency add in the Oreo cookie crumbs. 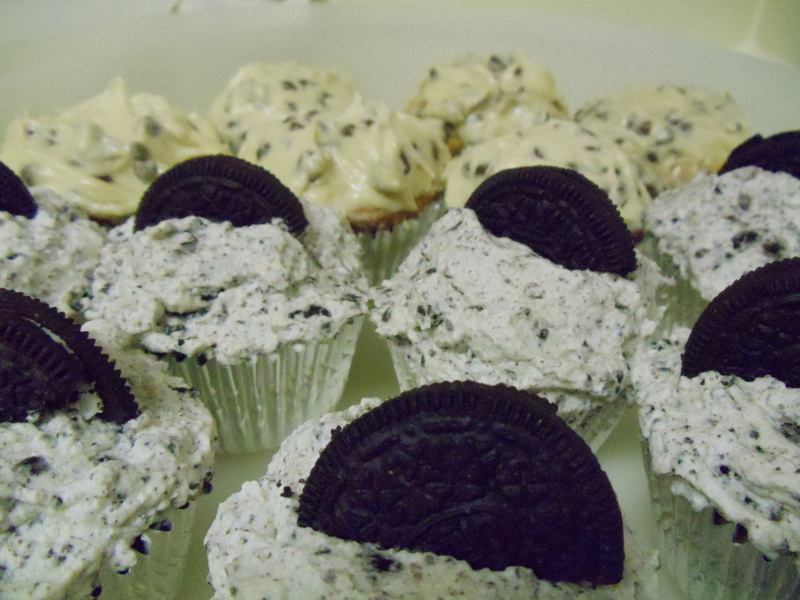 Ice on the cupcakes and top with an Oreo half. I recommend making either of these recipes as soon as you can, they were AMAZING! Adapted from Annie’s Eats and Love and Olive Oil. About three cups of confectioners’ sugar produces the right amount of buttercream frosting for a batch of 24 cupcakes. Use one tablespoon liquid to one cup sugar to two tablespoons plus two teaspoons butter. Adding whipping cream helps in making a fluffier frosting. I know everyone is very precise about measurements in baking, but I add to taste and aesthetic. Just be careful not to make it too runny. Sift the confectioners’ sugar, cocoa, etc. to prevent lumps in the frosting. Don’t overlook the sifting! No one wants a lumpy frosting. Begin with soft butter. Using butter that has naturally become room temperature is best, but if needed, soften the butter in the microwave.